Lying at the northern foot of Mount Zhongnan, 15 kilometers southeast of the seat of Zhouzhi County, Shaanxi Province, Louguantai is named after Louguan Terrace, the "No.1 Blessed and" in the lore of Daoism. 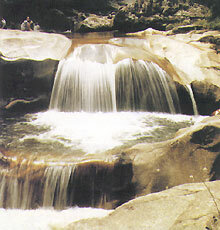 Louguantai is well known not only for its historical sites, but also for its extremely beautiful forests. Backed by the mountain and overlooking a river, the Louguantai National Forest Park is lushly clothed in trees and bamboo, and watered by limpid streams. 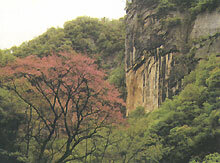 The park ranks first in the Mount Zhongnan area for vegetation, covering an area of 9,688 mu (1 mu =1/15 hectare). The highest peak in the vicinity soars 1,350 meters. The mountain is home to more than 120 species of rare animals, including giant pandas and golden-hair monkeys. The trees in the forest all have their distinct habitats: Chinese pine and juniper trees grow at 1,000 meters above sea level; and oak, locust, walnut and rubber trees, and bamboo can be found below 1,000 meters. The groves of bamboo embrace nearly 100 species. In addition there is a wildlife zoo in the park. Louguantai has been developed into a unique tourist attraction embracing both historical sites and scenic spots.